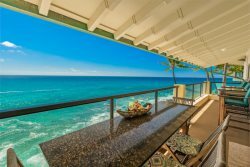 As comfortable as this Poipu Shores condo is inside, what makes the location spectacular and unique is the dramatic 500 square-foot lanai cantilevered over the cove below. It is not a common area of the resort and is shared only with the one bedroom condo next door. It has its own private lanai furniture, chaises, and dining set, as well as easy access to the pool. Enjoy this delightful space for lounging, savoring your meals, watching the abundant sea life, and for one of the absolutely best sunset views on the island. You will be enchanted by the relationship of the lanai to the ocean; it’s like being on a stationary sailing ship. Families of sea turtles and colorful fish graze in the cove throughout the day, dolphins cavort and spin in the waves, and in winter parades of Humpback whales cruise by, often putting on an athletic show of their own. This truly amazing one bedroom, one-and-a-half bathroom Poipu Shores condo has been completely remodeled and refurnished. It was designed and decorated by the architect and artist owners to make the most of this unique location perched on the very edge of the ocean above crashing waves. It is a serene retreat, yet only a five minute walk to the sandy shores and many amenities of Poipu Beach. The ocean is the focus of the intimate condo home with tall walls of ocean-front windows providing stunning views of the surf, the sea and the sky. Louvers provide almost constant cool tropical breezes. Large mirrors echo the views from surprising perspectives, bringing the ocean into the living areas. Artwork by the owner and others enhances the uniqueness of the space. Beauty, practicality and comfort make this condo a delight to occupy, with cool polished marble flooring throughout. The ceiling fans draw in the ocean breezes, and air conditioning is available if needed. Multiple window coverings and plantation shutters allow you to adjust the light and ocean breezes to your preferences. Counter tops and window sills in all the rooms are of slab granite flecked with glittering pyrite and quartz, with swirling patterns reminiscent of the sparkle and flow of the ocean below. Hand crafted on Kauai, the Shaker style glass-fronted cabinets contain the well equipped kitchen and entertainment options. A full range of appliances provide all the comforts of home. Under-cabinet LED lighting is cool, energy efficient and pleasing. The living area includes two comfortable love seats, and the dining area lets you sit right above the ocean and enjoy the incredible views. There are flat screen TVs in both living and bedroom, each with a DVD player to keep you up-to-date and entertained. There is a large library of books of local interest, as well as a DVD collection also with a focus on the Kauai theme. The carved teak platform queen bed has a latex pillow top mattress, and fine linens ensure your comfort as you drift off to sleep listening to the ocean's serenade. The generous en-suite bathroom provides for privacy and comfort. The river rock floor in the shower is a reflexology treatment in itself! A half-bath is conveniently located off the living room. You will find beach chairs, towels, coolers, binoculars and other amenities tucked away in the closets. When you can tear yourself away from the condo's amazing views and comforts to explore the wonders of the Garden Island, Poipu definitely offers the most convenient, central location, and the most reliable weather on the island. It is ideal. In all of Kauai there is but one lanai that sails out over the waves – 102B at Poipu Shores. Great, easy and efficient team to work with! Condo 102b is just fantastic! The happy vibe of the decor and all the amenities you could ask for! And the lani out over the water with turtles all day long just makes this condo even more amazing! We felt that we were staying on our own home. The apartment is well appointed and the perfect location. It went far beyond my wildest dreams! It is a stunning property! I would return in a heartbeat! The stars were fabulous! The lanai with the crashing waves and the sea turtles was breath taking! They were very well informed, very friendly. made me feel like one of the family. Love it. Have always came back here when we stay in Kauai. There is no other place like it. Patricia & Brett were the people we worked with and they were both wonderful! Could not have asked for anything more. They both made our stay very comfortable. We have been here 4 of our 7 days and enjoyed it immensely!